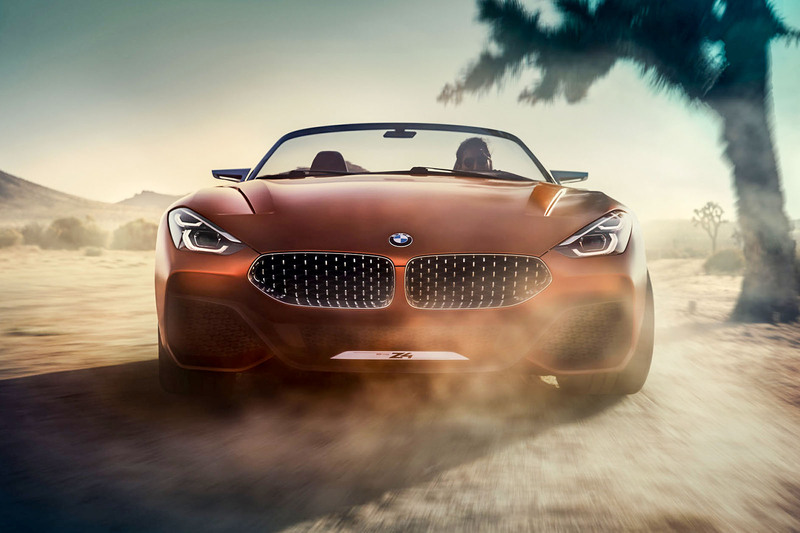 BMW has revealed the Concept Z4, a preview of the German firm’s third-generation roadster, at the Pebble Beach Concours d’Elegance in California. Boasting a fresh look, new underpinnings and a revised range of engines, the two-seat soft-top has been developed in a joint engineering programme with the new Toyota Supra, which will be offered exclusively in coupé guise. 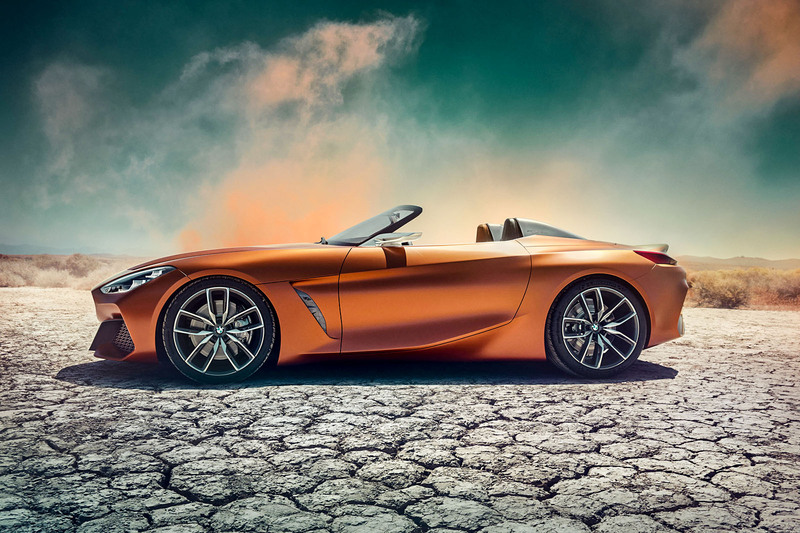 The appearance of the Concept Z4 comes more than six months before BMW plans to unveil the production version at the Geneva motor show in 2018. UK sales will be under way by the middle of next year. While some of the more flamboyant design features will be toned down, the overall styling and detailing of the concept is claimed to be very close to the production car. 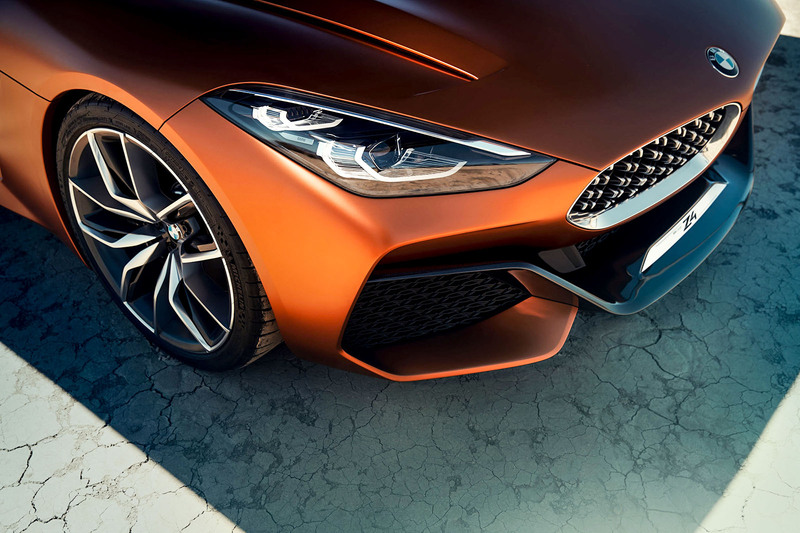 Design boss Adrian van Hooydonk said the car “expresses the new BMW design language from all perspectives and in all details”. The BMW Z4 has more comfort and added practicality, but has it gone soft? The Concept Z4 is bigger than the current model, with a longer wheelbase and wider tracks. BMW rethought the proportions in a bid to provide it with a more focused look. “A shorter bonnet and crisp overhangs ensure the driver sits closer to the centre of the car than in previous BMW roadsters,” said van Hooydonk. The approach signals BMW’s determination to shift the Z4 further upmarket. During the car’s development, BMW board members considered renaming it. However, the German car maker’s naming system groups even numbers among its coupés and cabriolets, so the long-mooted Z5 badge was never seriously considered. The Concept Z4 features another interpretation of BMW’s signature kidney grille, seen recently on the Concept X2 and Concept 8 Series. In place of the customary vertical bars, the insides of the kidney grille feature a new mesh that van Hooydonk said was inspired by the functional treatment used on early BMW roadsters, including the iconic 328 Mille Miglia. The long bonnet, meanwhile, retains the clamshell design of previous Z4 models. On the concept, it features two vents. However, these are unlikely to make production, according to Autocar’s sources. Certain licence has also been taken with the concept’s windscreen, which does not have the sturdy surround of the production version, and the two metallic domes conceived to act as rollover protection will be replaced by more conventional rollover hoops on the production roadster. Although BMW has yet to officially confirm it, the new Z4 eschews the folding hard-top of today’s model for a traditional fabric hood. Already sighted on prototype versions of the two-seater, the hood folds and stows underneath a dedicated tonneau cover at the rear of the cabin. BMW has provided a clear glimpse of the look and layout of the new Z4’s interior. The production car will have a flowing dashboard and relatively wide centre console resembling those of the concept. Features such as the digital instrument panel and head-up display included in the show car will also make their way on to the new roadster. However, the brushed aluminium and carbonfibre trims will be replaced by more cost-effective composite plastic materials. Accommodation is said to have improved thanks to the car’s increased overall dimensions. Boot capacity is also claimed to top the 310 litres of the outgoing Z4. The new Z4 is underpinned by BMW’s CLAR (cluster architecture) platform. It is already used by the 2, 5 and 7 Series and is also set to be adopted by the upcoming 8 Series and the successor to today’s 3 Series. The CLAR platform is allied to a multi-material body structure, featuring a combination of high-strength steel, aluminium and magnesium. Insiders suggest the new roadster will tip the scales at under 1400kg in its most basic form, despite the increase in dimensions. 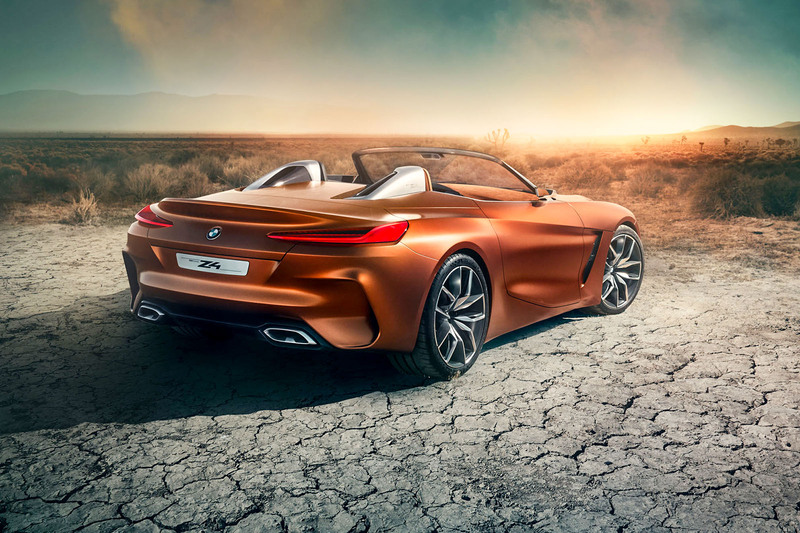 An internal BMW document seen by Autocar revealed that the new Z4 will be offered with a choice of two petrol engines from the start of sales. The first is a turbocharged 2.0-litre four-cylinder unit expected to develop around 181bhp in the Z4 sDrive20i and 248bhp in the Z4 sDrive30i. The second engine powers the Z4 M40i and is the latest incarnation of BMW’s B58 turbocharged 3.0-litre in-line six-cylinder engine. It is rumoured to develop the same 355bhp as it does in the X4 M40i. A full-blown M version of the roadster, running the BMW performance car division’s 425bhp twin-turbo 3.0-litre in-line six-cylinder, has also been mooted, but it has yet to be officially confirmed by BMW. True to tradition, the three initial Z4 models retain the rear-wheel-drive layout that has been part of the two-seat roadster’s appeal since its introduction in 2002. Buyers are set to be offered the choice of a six-speed manual or eight-speed automatic in combination with all engines. Production of the new Z4 and Supra will start at the plant of Austrian manufacturing specialist Magna in early 2018. So clearly the new Z4 is going to look like this, ja ? Er, definitely not ja..... So, we'll just get another formulaic BMW from a design studio that increasingly turning out designs with little BMW mojo. Can Mr Kaban do what he's done at Skoda ? I'm sure the board of JLR (and every other premium car maker) hopes not. Yes,yes it is, this Car was needing an update,more tech inside, a hybrid in the range too wouldn't go amiss. Will the Toyota come with a reliable Japanese engine or an unreliable BMW one?